Vince Lombardi High School continues to lose its school principles. The students are more concerned with rock 'n' roll than their education until the new principle, Miss Evelyn Togar is hired. She promises to set Vince Lombardi High School straight, and get the students focus back on education. However, a Ramones concert is coming to town, and Riff Randall, the biggest Ramones fan at the high school, plans on getting tickets to the concert in order to give them a song that she wrote entitled "Rock N' Roll High School". 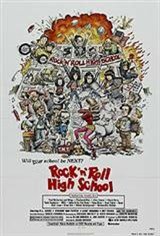 A series of events including Miss Togar taking away Riff's tickets, a record burning and a taking over of the high school by Vince Lombardi High students and the Ramones, leads to a school evacuation by the police and an even more surprising ending!